Can anyone explain how to install GDAL/OGR with Python on Windows? I have Windows Vista and I have tried following the information on the website and it does not seem to bind the exe files for me. Can someone describe the process, including links to the files/folders I will need? Unless you have good reasons not to, I'd definitely recommend starting with the OSGeo4W installer, which can install multiple different versions of GDAL and their relevant Python bindings. It works great and dramatically simplifies the Windows deployment story. 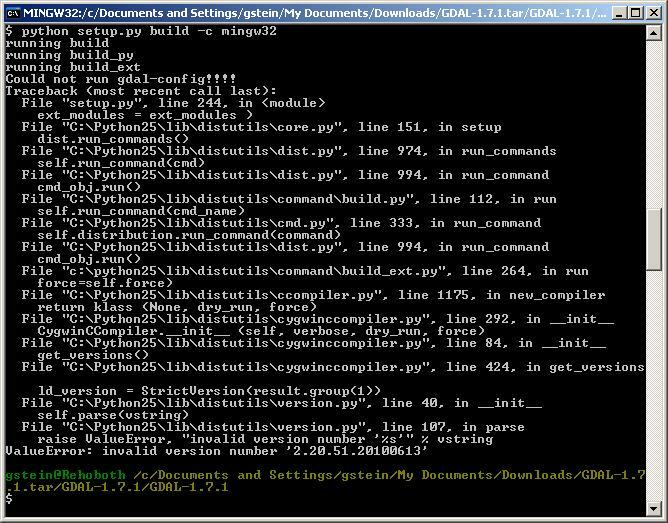 Specifically, you'll want to install pkg-gdal-python, which is within 'Libs' in the installer tree. You can download GDAL wheel package from Christoph Gohlke's Unofficial Windows Binaries for Python Extension Packages. While the package is not built by OSGeo or GDAL developers, it is a high quality distribution with support for the latest versions of GDAL compiled for 32-bit and 64-bit versions of Python. No external libraries need to be added or managed! Update it even sets the GDAL_DATA environment variable, if it is not set, and includes a PostgreSQL driver to read data from PostGIS. Another option is to install the Anaconda Python distribution which has packages for GDAL. If you are going to be doing a lot of work using GDAL with other Python packages (scipy, pandas, scikit-learn etc.,) this might be a better option than OSGeo4W. On the other hand if you want to use Python in combination with a number of open source remote sensing and GIS packages (GRASS, QGIS etc.,) OSGeo4W is probably the better option. As part of the installation it will prompt you to add to the main path (so it is available from any terminal). Then activating it as show when the command finishes. Installing into a new environment is recommended to avoid conflicts with other packages and make sure the environmental variables required are set. I've suggested installing from the conda-forge channel (https://conda-forge.github.io/) as they are very active in keeping their GDAL builds up to date and making sure they work against a lot of libraries. Here is another tutorial which explains very simple and easy way of installing GDAL v1.8 with Python v2.7 on a Windows XP/7 system. I find OSGEO4W a poor solution because it creates a whole parallel universe, almost like a virtual machine. I was able to install GDAL and use it in python following the steps outlined here (this is the link provided by @sys49152). Now you have to choose between 32 and 64 bits and different Microsoft Visual C++ compiler versions. Note that this has to match your python version, not your OS. In my case I have a 64 bit windows, but a 32 bit python 2.7 (that shipped with ArcGIS). So I need to use "release-1500"
And added the path and other variables as described here. I know The OSGEO installer was mentioned, but as GuidoS said it doesn't work unless you're on the osgeow shell, which is fine and dandy if all you're doing is basic python. Chances are if you're not, you either have to reinstall the package and then have to run your app/plugin from that folder or have to compile all the dependencies for gdal and install it again. Thanks to blog post at http://fuzzytolerance.info/code/postgis-raster-ftw/ for the link. Its really not that difficult to do. I've compiled it many times before using Visual Studio without any issues. Just follow the directions here: link text. It's pretty straightforward, just read through the well documented makefile.vc and set the appropriate directories, notably the Python one. Once it's built you should have a Python module built which you can then copy to your Python installation, which I've always done maually, but there is probably a more approriate method. The two top answers by @SCW and @Mike Toews are great. The site listed by Mike is for unofficial binaries - which was very useful when 64 bit GDAL was not readily available (as per the time he wrote his reply), but it has been now for some time. I have added this alternative answer here as, although I have mentioned it many times, it still keep cropping up and this wiki may be a better place to put it. If you want to install just the GDAL Binaries for Python on a windows machine I would get the installers from the excellent GIS Internals Site. This site is linked from the official GDAL/OGR Binaries page. This gives you access to GDAL through a normal Python install without any need for using the osgeow shell. The binaries here are regularly maintained and compiled against a variety of versions of Visual Studio (so choose depending on what runtimes you have installed). Like the other contributors, I advice to choose OSGEO4W installer. I use FWTools in Windows XP. It includes a Python installation with the GDAL libraries. After installation, just run your Python scripts from the FWTools Shell. I just did it yesterday following this tutorial http://www.gis.usu.edu/~chrisg/python/2009/docs/gdal_win.pdf It worked fine to me. Not the answer you're looking for? Browse other questions tagged python gdal installation windows or ask your own question. How to install GDAL for python on windows and use for spatial purpose? How to speed up raster to polygon conversion in R?